Heber Overgaard is a small town in Navajo County, Arizona, United States. The community lies on top of the Mogollon Rim at an elevation of around 6,500 feet. The year round population is around 2,700+. The summer/seasonal or part time residence more than double this number. Tourism, retirement and timbering are the foundations of Heber-Overgaard’s economy. Located along Highway 260, approximately 35 miles from Show Low and 1500 feet higher than Payson in elevation summer temperatures barely top 85 degrees. Most of the highway is now 4-lanes. Heber was founded in 1876 or 1877, by members of The Church of Jesus Christ of The Latter-day Saints or better known as the(Mormons), and the town was named after Heber J. Grant, a prominent member of the church. The Heber post office was established in 1890. Overgaard the neighboring community was settled in the 1930s and was named after the owner of the first sawmill. It was originally called Oklahoma Flats. Mormon pioneers first settled in here in the late 1800’s. Many settlements were located in the fertile ranching and farmland in Black Canyon. Horses were used to haul logs up until 1965. Logging and ranching were the predominant industries here until 1991. Here is where you will find the famous Bison Ranch Community, with log cabins, custom build luxury homes, condos, vacation rentals, hotel, horse stables, shopping, dining and of course the Bison. The area is a popular summer getaway for people from warmer parts of the state such as Phoenix and Tucson. Heber-Overgaard has managed to retain it’s small town feel where folks seeking to escape the stresses of the hot hectic city life can visit, unwind and reconnect with family, friends and nature. 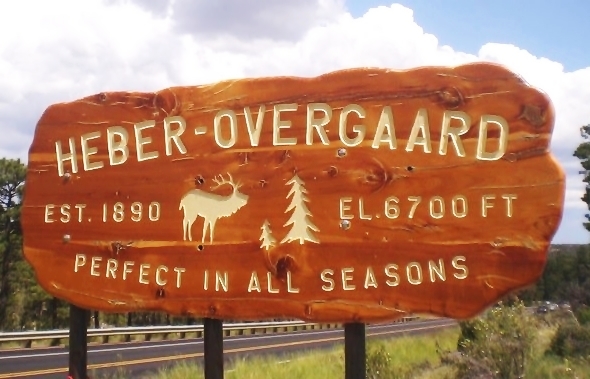 Whether you enjoy hunting and fishing, hiking or camping, reading or relaxing, you’re sure to find your fix in Heber-Overgaard. The community offers numerous family ran restaurants or chain names, many lodging choices, a library, various church denominations, resident medical, dental and chiropractic offices, 2 markets, 3 hardware stores and a sporting goods store. They have an elementary, middle and modern high school that has since replaced the rodeo grounds and potato farm that Alva Porter had planted in the early days of Heber’s settlement. Partially ringed by mountains, the school’s large playing fields provide the perfect echoing backdrop for the annual July 4th Celebration and Fireworks show. Tall Timbers County Park, located just west of the U. S. Forest Service Black Mesa Ranger Station in Overgaard, is a welcoming and ideal spot for the Oktoberfest, Winterfest and 4th of July festivals. The park also has fully equipped picnic areas, facilities for handball, racquetball, baseball and a playground for the children. The Sitgreaves National Forest surrounding Heber and Overgaard is home to some of the state’s most talked about hunting ground. Elk is the predominant species, and with many bulls (males) taken from the area are considered to have “world class” sized antlers. The area also supplies deer, turkey, bear, mountain lions, squirrel’s, coyotes, rabbits and other small game. Valid Arizona hunting licenses and permits are required to hunt any of these species.